Ballroom Ceremony & Reception | $1,600 - 5 hour reception, 1 hour rehearsal day before, day of coordination, one night stay in our Maine inspired honeymoon suite, bartender, full bar set up and teardown, cake cutting service, and a dance floor. $1.00 linen charge per person. 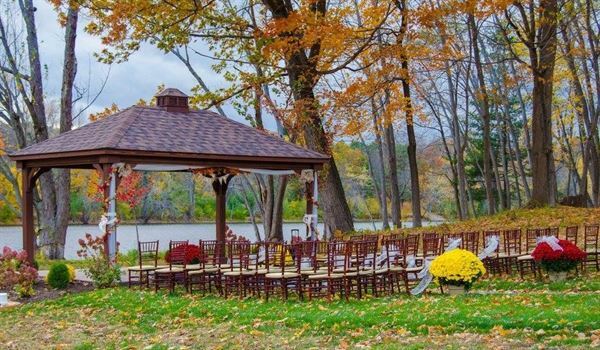 Ceremony on Black Bear Inn Lawn | $500 - Includes 1 hour rehearsal day before, use of mahogany chiavari chairs, and day of coordination. Chair covers optional for $2.00 each. *Over 125 guests - $1,200.00 with chair covers. Ceremony in Pink Room | $500 - Includes day of coordination, and 1 hour rehearsal of ceremony. Ballroom Reception | $1,500 - 5 hour reception, one night stay in our Maine inspired honeymoon suite, bartender, full bar set up and teardown, cake cutting service, and a dance floor. $1.00 linen charge per person. The Blue Room is located on the lower level and has 3,960 square feet of meeting space. The room comes with a built-in dance floor, a full service bar, and access to AV. The room is beautiful on its own but can also be transformed to fit any theme. Atmosphere/Decor: The ballroom has a large built-in dance floor, full cash bar, and beautiful chiavari chairs, and can be transformed to go with any theme. Special Features: Offering conference services that include audiovisual assistance, off-site activity coordination, business services and catering. The bar is a cash bar with open bar options. For weddings, we love to feature "His and Her" drinks. One of the three sections of the Pink Room. The Pink Room is located on the main level and has 3,600 square feet of meeting space when completely opened. The Pink Room can accommodate up to 275 people for a banquet. The room can also be divided into three smaller rooms if necessary, offering breakout space for meetings and conventions. Atmosphere/Decor: The Pink room is a perfect atmosphere for meetings, conferences, and wedding ceremonies. Special Features: Offering conference services that include audiovisual assistance, off-site activity coordination, business services and catering. The room itself features a dance floor and a full service bar. I highly recommend Black Bear Inn for a wedding ceremony /reception venue. It was ideal for out of town guests and very convenient. Abby and Tracy are top notch when it comes to day of coordination and working with you throughout your process of wedding planning. The food is excellent and there quite a large selection to choose from including snacks. We chose a popcorn bar which was a Huge hit! The ladies at the front desk were also so helpful! Rooms are gorgeous ( stay in the suite!) can't say enough about how great the experience was! Special Features: Over 7,900 square feet of meeting space, the Best Western Black Bear Inn & Conference Center. One of the state's ADA approved hotels, and all areas of the hotel are accessible for the physically disabled.